Picturing himself in a location familiar to him as a farmer’s son, Heaney composes a sonnet about birth and renewal. The poet weighs up the signs of pregnancy evident in the first instance (It seems) from the cow’s sheer bulk (as if she had swallowed a barrel) and from her sagging undercarriage (slung like a hammock) from front (forelegs) to rear (haunches). Farming experience recognizes the physical methods required to shift a cow (slapping her out of the byre). The smacks administered sound somehow different with a calf inside her body: solid, dull sounds like slapping a great bag of seed; smacks so weighty that his own hand suffers physical punishment (no doubt a distant memory of school!) smarting as if strapped, echoing like distant wartime underwater explosions (plump like a depth charge/ far in her gut). The signs of impending calf production emerge: the growing udder resembles a wind instrument with its bagpipe’s windbag, producing a drone ‘continuo’ accompaniment to her lowing. Heaney reflects sadly if stoically upon the ever recurring (keep coming and going) loop of a cow’s existence from milk production to motherhood: cud … milk … heats … calves. 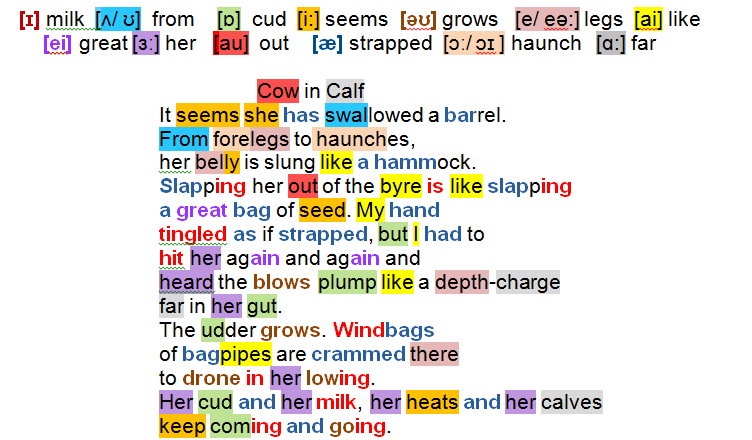 the music of the poem: thirteen assonant strands are woven into the text; Heaney places them grouped within specific areas to create internal rhymes , or reprises them at intervals or threads them through the text.